Victoza is the brand name for the generic drug Liraglutide. Liraglutide is a glucagon-like peptide-1 receptor agonist that helps the pancreas release more insulin after a meal to keep a person’s blood sugar levels under control. The medication is currently available as a once-daily injection (VictozaPen), but an oral form of Victoza is undergoing testing. Victoza stimulates the production of insulin as needed, based on the body’s blood glucose level to decrease post-meal hyperglycemia. The medication is active for 12 hours after the injection to provide benefits through all of the patient’s mealtimes. Victoza is made by a company called Novo Nordisk, which is one of the largest and broadest-reaching pharmaceutical companies that produce medications for diabetic patients in the world. Its generic name is liraglutide, but the generic counterpart of this medication has not yet been approved for sale. It is a newer medication when compared with some of the other treatments available to patients with type 2 diabetes and it should not be used to treat any other form of diabetes or hypoglycemia. Liraglutide should be used with other therapies for diabetes treatment, including exercise and healthy eating habits. 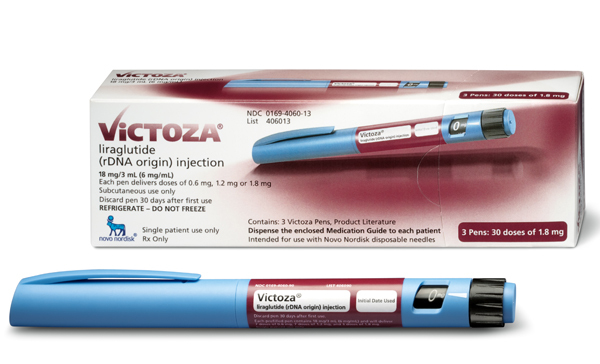 At this time, Victoza is used as part of a complete treatment and prevention plan for patients with type 2 diabetes. Individuals with this condition do not produce enough insulin on their own to control the levels of glucose, or sugar, in their blood. This can result in hyperglycemia, meaning the body has too much sugar. The other extreme, hypoglycemia, occurs when blood glucose levels drop too low. Victoza works with the pancreas and digestive system to prevent either of these potentially life-threatening conditions from occurring. Because Victoza is still a new medication, other possible uses, as well as side effects are still unknown. It is usually prescribed in addition to other medications for diabetes, which may influence the patient’s reaction to the drug. Liraglutide is often referred to as an incretin memetic; it actually mimics the action of incretin—a hormone released during meals—in an effort to increase the amount of insulin the body produces on its own and decrease the amount of glucose in the bloodstream. This medication also slows the time it takes for food to leave the stomach, thereby helping to keep patients’ appetites under control and sometimes even helping them to lose weight. Patients should not be concerned with hypoglycemia, or low blood sugar, because the medication is specially designed to respond only to high levels of sugar in the blood. Victoza is taken once daily at the same time each day by injection and is 97% similar to the naturally occurring hormone in the body that signals natural insulin production. It is not an insulin product and should not be taken with insulin-containing medications or any other drug that increases the amount of insulin in the bloodstream. It is not recommended to be the first medication used to fight type 2 diabetes, but it is a wonderful alternative for patients who do not respond to more conventional therapies. Since it is not known whether this product is safe or even effective in children, patients under the age of 18 should not use it. This medication should only be used once a day unless otherwise directed by a physician. Patients can expect to experience some mild side effects, but these generally lessen or even disappear over time. Liraglutide comes in a pen that is filled with 18mg of the medication, so the number of doses in the pen will vary depending upon the prescribing physician’s instructions. The medication is administered through a disposable 32-gauge needle that is the thinnest of its type. Patients who have any other questions about this medication should contact their physicians or pharmacists for more information. Patients whose diabetes is not adequately controlled with other medications may find liraglutide to be a great option. When used in a combination with a healthy diet and exercise, Victoza has the ability to get type 2 diabetes under control and allow patients to live healthier, happier lives.